Personally, I find that, at the start of the season, I can hardly contain myself. It’s completely unsustainable, and I know I’ll feel different in June or July, but right now, I’m trying to keep up with as many damn baseball games as possible. I try to follow baseball in the morning, I try to follow baseball in the afternoon, and last night I was following the Dodgers and the Diamondbacks until they stopped playing around midnight. My situation is different — I’m not coming at this from a single-team perspective — but I know a lot of you feel the same way. Baseball is back, and we feel compelled to gorge ourselves on it, after too long of an absence. I ran a polling project last week, asking you all about your excitement levels. In one way, it was a silly thing to do, because we all agree that having baseball is better than not having baseball. It’s pleasing to have actual action to observe, discuss, and analyze. In the post, though, all the polls were broken down by team, so that different fans could vote in different ways. I know we’re all happy, but I’m always interested in how the baseball fan landscape breaks down. With your participation, we can see who’s most excited, relatively speaking, and who’s the opposite of that. I think I’ve waited long enough. 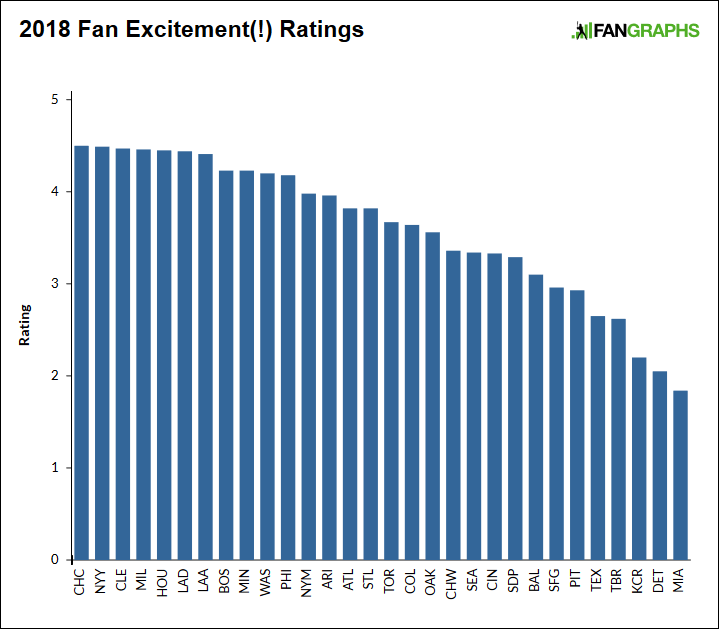 And so here are the 2018 fan excitement ratings, according to the FanGraphs community. Make as much or as little of this as you want. Each poll, for each team, had five options, expressing varying levels of excitement about the season ahead. As always, in order to analyze, I assigned numbers to each result, from 1 to 5, 5 being the most excited. By putting everything together and dividing by the total number of votes for each team, I could calculate an excitement average, which is the rating you see in this plot. Here are all 30 teams, from the Cubs to the Marlins. Obviously, Cubs fans are excited. Why wouldn’t Cubs fans be excited? Their team is great. And, obviously, the Marlins poll was something less than enthusiastic. If you’re just looking to make a general observation, these ratings follow almost exactly what you’d expect. That is, unless you’d expect everyone to be identically excited, since the most important thing is that baseball is back in the first place. But baseball can lead to happiness, misery, boredom, and frustration. I don’t need to explain human feelings to you. It’s true that the Cubs rank No. 1. It’s also true that they’re just barely there. They wound up with a rating of 4.50. Yet the Angels, in seventh place, wound up with a rating of 4.41. That’s hardly any separation, and so you could say we see a highest tier, with the Cubs, Angels, Yankees, Indians, Brewers, Astros, and Dodgers. There’s a drop-off that leads to the next tier, and then as you go all the way to the right, the Tigers are the only team particularly close to the Marlins. And the Royals are the only other team particularly close to the Tigers. The overall average rating is 3.61, which falls in between “kind of excited” and “pretty excited.” The median rating is higher, at 3.74. The median teams, in this case, are the Cardinals and Blue Jays. There is your mid-level fan-excitement reference. Anything below that and you’re not feeling the feelings you’d probably like to be feeling. The last time I ran this project, in 2016, there was, of course, a strong relationship between excitement rating and projected wins. The R^2 back then came out to 0.58. Once more, we can see a strong relationship between excitement rating and projected wins. The R^2 this time comes out to…0.58. Numbers are incredible. Using projected wins alone, it’s pretty easy to calculate an “expected” excitement rating. 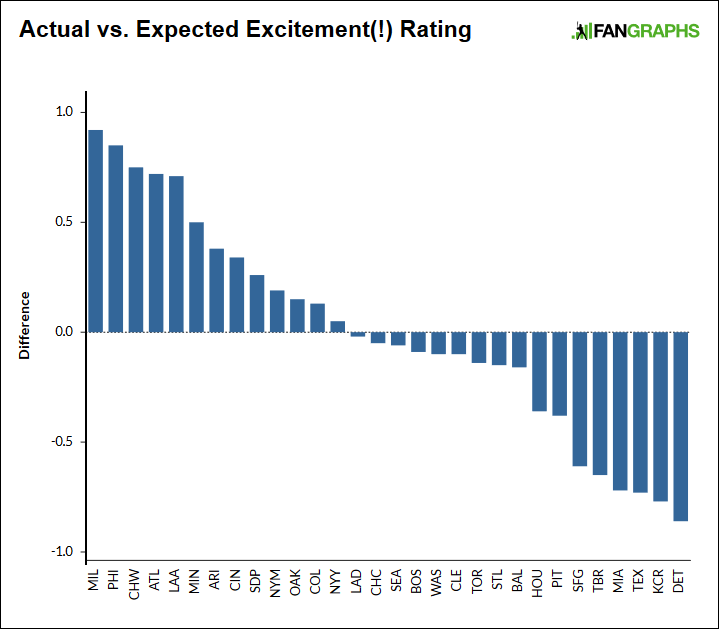 From there, you can look at the difference between the actual and the expected excitement ratings. Here’s a plot of those results. The Brewers lead the way, with an excitement rating 0.92 points higher than expected. That’s not completely surprising — the 2017 Brewers over-achieved, and you recently agreed that our Brewers team projection is too pessimistic. You don’t see the Brewers as a .500 ballclub. In fact, if you reverse-engineer the numbers, the Brewers’ excitement rating would correspond to a 95-win projection. That’s how amped up Brewers fans are. Thanks to the Cinderella season, thanks to adding Lorenzo Cain and Christian Yelich, fans are excited about the season as if the Brewers are elite. The Phillies show up as somewhat similar — their rating is 0.85 points higher than expected. That would correspond to a 90-win projection. Fans are ready for the rebuilding Phillies to return to contention, now that they’ve added Carlos Santana and Jake Arrieta along with a couple relievers. To round out the top five, clearly, there’s positive rebuild enthusiasm around the White Sox and Braves. The White Sox have prospects out the wazoo, and the Braves have Ronald Acuna. And, the Angels? The Angels have Shohei Ohtani now. To say nothing of, you know, Mike Trout, and all the rest. Theirs has been a season to highly anticipate. At the other end, morale is low in Detroit. Even though the Tigers have projected to be better than the White Sox, it’s just not that intriguing a roster right now. The Tigers certainly aren’t good, but they’re also fairly old and fairly expensive, and the farm system is only slowly improving. They don’t appear to have the White Sox’ breakout potential. I wouldn’t put the Royals in exactly the same boat, but the fans understand the team will be laying low, being without Cain and Eric Hosmer. The Rangers, to me, are moderately surprising here, since I don’t think you have to squint too hard to see them as a wild-card club, but the margin of error is narrow, and the future prospects look fairly dim. The Marlins — they’re the Marlins. And to complete the bottom five, Rays fans haven’t loved the double-whammy of weird trades and pitching injuries. At last, one more plot. In November, in another polling project, I asked you all to rate your 2017 fan experiences. 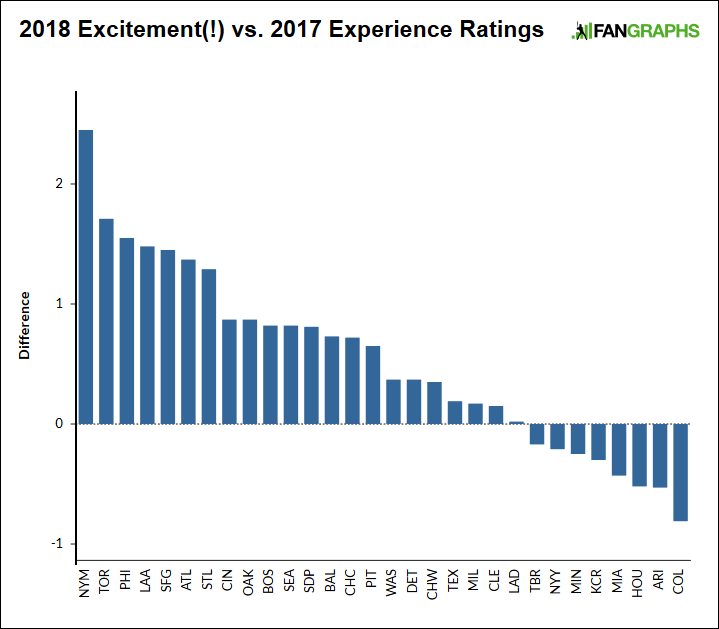 Below, the landscape of differences between 2018 excitement ratings and 2017 experience ratings. Most teams have seen an increase, because it’s a lot easier to be excited about the future than it is to be happy about the past. The average excitement rating is 3.61. The average experience rating was 3.07. The Mets take it, running away. By 2017 fan experience, the Mets finished in 29th place, just barely ahead of the Giants. By 2018 fan excitement, the Mets find themselves in 12th place, between the Phillies and the Diamondbacks. While I know there’s a lot more to the Mets than just Noah Syndergaard, I imagine he has to be the biggest factor here, since he’s healthy, and arguably the best starting pitcher in baseball when he’s 100%. Syndergaard is back, and the Mets could make it to the playoffs. It’s easy to think about a healthy pitching staff when it’s only the first week of the season. Credit Mets fans for allowing their enthusiasm to rebound. That doesn’t always come so easy. Blue Jays fans think their team will at least somewhat bounce back. The same goes for the Giants. Angels fans have Ohtani now, and Phillies fans can see their team in transition. At the far end, you see the two 2017 NL wild-card teams. It’s not that they’re bad; it’s just that 2017 was so much fun, after the Diamondbacks and Rockies both exceeded projections. The Astros are over there, too, but mostly because there’s no way to top winning the World Series. Even a second World Series title couldn’t compare to the first. The Astros and Marlins are over there for very different reasons. Thank you all for your votes. You certainly haven’t seen the last of these polling projects. We hoped you liked reading The 2018 Fan Excitement Ratings by Jeff Sullivan! While a healthy Syndergaard is a huge reason why Mets fans are excited I think that other key factors in the fans’ optimism for this new season are the new coaching and training hires and the shift in philosophy of the team’s medical personnel. Most of the fan base had grown beyond frustrated with Collins’ mismanagement of the bullpen and other in-game situations as well as a general lack of control of the team. While the real problem is still the team’s ownership there are plenty of talented players on this Mets team and with the changes that have been made there is good reason to be excited. Add in a healthy Cespedes and a real 3B.